Please note that the content of this book primarily consists of articles available from Wikipedia or other free sources online. 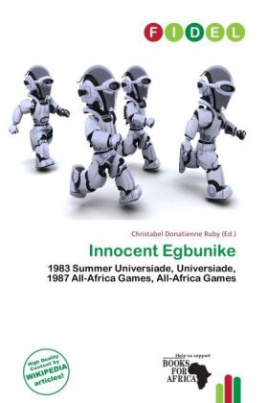 Innocent Egbunike (born November 30, 1961) is a former sprinter from Nigeria who won an Olympic bronze medal in 4 x 400 metres relay in Los Angeles 1984. He finished sixth in the final of the individual 400 metres contest. Four years later in Seoul he placed fifth. In addition he won a silver medal in the 400 metres at the 1987 World Championships. He also won the gold medal in the 200 metres at the 1983 Summer Universiade with a personal best of 20.42 seconds; he followed this by finishing 6th in a world class field in the 200 metre final at the 1983 World Championships in Athletics in Helsinki.